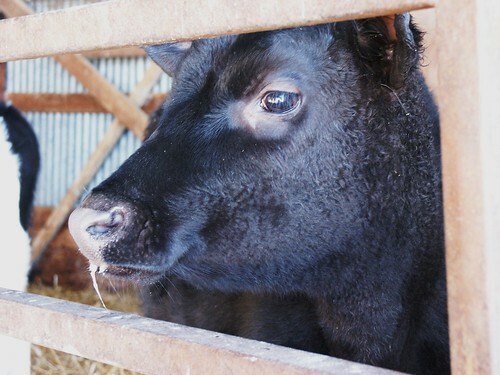 Today was the day for the much-anticipated cow share farm visit at Our Farm & Dairy. It’s gorgeous and sunny out, completely, spectacularly beautiful at a balmy 18 degrees F. Fortunately, Mike’s mom got me some CuddleDuds for Christmas, and wowsers – these things are warm. I could probably turn the heat in the house plumb off if I could convince Mike Neir to wear them – we shall see about that. The farm is about 45 minutes away, near St. Johns, tucked back along some lovely, farm-filled country roads. 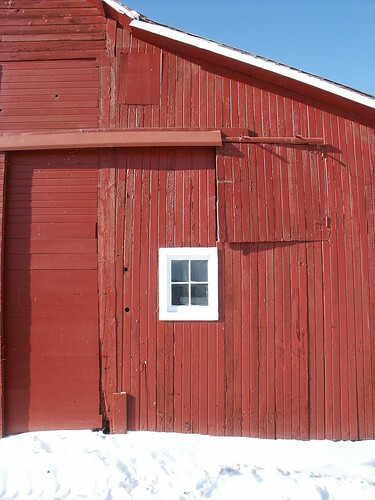 I do love drives in the country, past houses and barns built in the 1800’s, some of them well-kept, others less so. 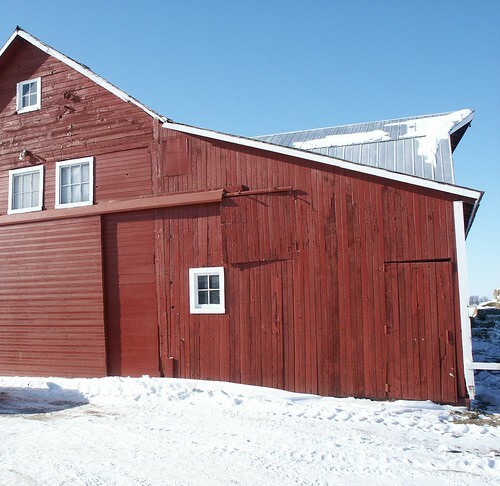 Give me a good barn to look at, and I am le happy. My camera ate its batteries very quickly in the bitter cold, so sadly, I didn’t get nearly as many photos as I would have liked, and many of the black calves in the dark barn didn’t turn out as well as they could have, but here are a few glimpses into the farm. An explanation of the cow share program itself follows. I could spend all day looking into eyes like these, I swear, and certainly all day taking photos of them. We’re joining a group of families in Williamston who team up to go fetch the milk every Friday. There are eight families, so we’ll only have to go to the farm to pick up the group share once every two months – that’s not bad! It came as somewhat of a surprise that the milk is self-serve from the large tank. I had enivisioned it pre-bottled and ready to go, but that would entail a lot more work for John’s family, not to mention require a bunch more storage space. This is a far better design than other milking barns I have been in, and it was very clean. The milk is run through those overhead pipes into the next room, where it is dumped into a large cooling tank, which will cool it right down to 33-34F without the milk ever having been exposed to open air. John gave us some really great explanations of the milking process, why they’ve made the choices they’ve had, and even answered my questions about veterinary care. He told us the expected seasonal changes in the milk, how it goes from nearly pure white now to a deep, golden yellow once the cows are out on good pasture after winter, and how the taste will change a bit, as well. The milk given out is whole and raw, meaning it’s not homogenized or pasteurized, and thus, it may not keep as long as the store-bought stuff. It will need to be shaken before pouring, unless you want to pour off the cream for your coffee. Everything is pretty laid-back and relaxed, even the contract walk-through. He explained most possible contingencies that might result in a “no-milk” week, or a delay, and that they’d contact us for any unusual event. On pick-up day, it’s BYO Containers. They offer very nice half-gallon glass milk jugs at the farm for $3 apiece, and he gave us four complimentary ones (plus a gallon of milk!) to get us started. They offer cream separation service, sometimes have eggs in the summer from another farm, and sell a local maple farmer’s syrup. He poured us our jugs, explained how to work everything and told us where stuff would be. 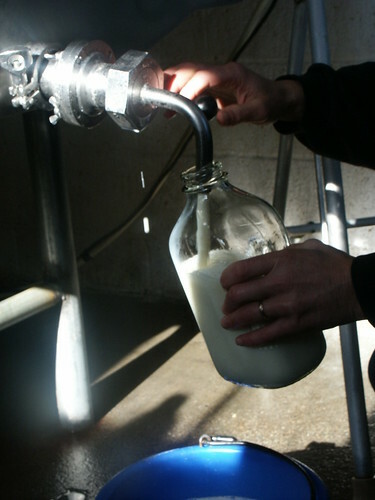 Raw milk from glass bottles – I could not be happier. 🙂 He poured Mike and I a cup to sample, just to make sure we thought it was delicious – it was, despite Mike Neir’s brief apprehension. The bucket under the spigot gets fed to calves and pigs, so it’s not wasted. For those of you Michiganders who are interested in this program, there will probably be a delivery group near you. If not, you’re always welcome to go up weekly or bi-weekly to gather your milk. For non-Michigan folks, you may be able to find a local source here: Real Milk. “Thank you for your interest in our cow share program. We do already have a milk group from the Williamston area, if you’d like I can check and see if the group has room for another person. They come on Fridays and take turns picking up about 7 families milk. “You could also come every other week, we have several people that do and say they don’t have a problem with the milk lasting that long. “To start the program you would just have to make one trip to the farm. At that time we can send you home with milk to try. We’ll also show you around and go through the cow share agreements. Because of the Christmas season, we’ll have appointments available beginning again on Saturday January 2nd at 10:30 am 11:30 am or 12:30 pm or any Saturday in January at the same times.You can plan on about a 40 min. visit and you are more than welcome to bring your whole family. Below is the specifics on how the program works. Please let us know if you have any further questions. 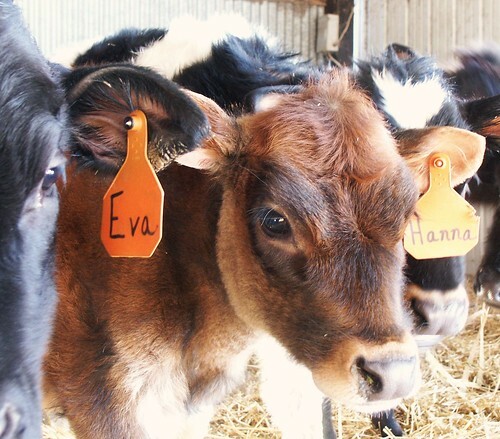 “We manage a group of dairy cows owned by several people. Ownership is in the form of shares. People buy shares depending on how much milk they need. Full shares cost 125.00 and ½ shares are 62.50. 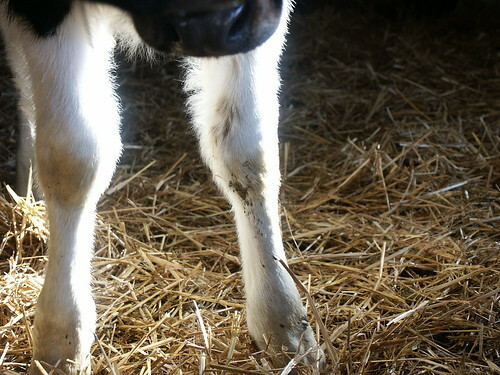 Full shares currently provide 2 gallons of milk a week and ½ shares provide 1 gallon of milk a week. These shares are good for 5 years and you can sell them at any time. There is boarding you’ll need to pay to cover the cost of your share (s ) as well. Full shares pay 45.00 a month and ½ shares pay 22.50 a month. We also have a cream separation service where we can separate your milk for you, giving you very heavy (pours like molasses) cream. “The 125.00 is pro-rated 20% a year. Meaning if you sold it in year 2 we would write you a check for 75.00 to buy back the share. After 5 years there is no monetary value, but you’re welcome to stay with the program for as long as you continue to pay boarding. 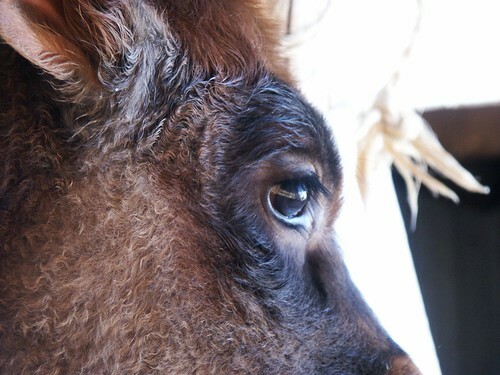 “We have a mostly Jersey herd of cows, with a couple New Zealand Friesian crosses. Cows are milked in a modern day parlor where the milk goes through stainless steel pipes into the bulk tank where it is cooled in less than 25 min. The cows have been tested for Brucellosis, Jhones and TB. The milk gets tested both on-site and off-site at a certified milk lab on a routine basis. “All cows are grazed in season. They usually have a good grazing season from April 1 – Nov. They and the land are all certified organic, which means they never get any supplementation (hay in the winter, for example) that is not certified organic and they are never treated with any hormones or antibiotics for any reason. “Most people are part of milk groups taking turns picking up each others milk at the farm, others come out by themselves weekly or biweekly. We have milk groups all over MI and we can check to see if there is a group in your area. We also have some owners who will deliver your milk to your area for a fee. “Please let us know if you have any further questions about the farm. 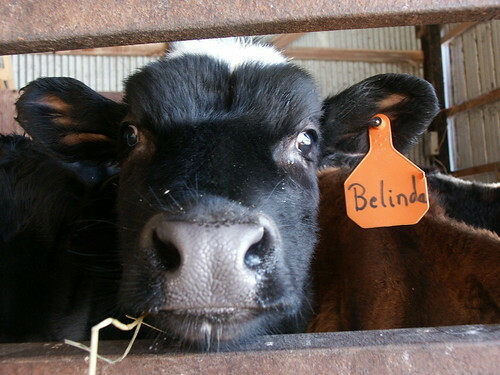 We would love to have you out to the farm to try the milk, take some home, and see the cows and the farm itself. Thank you. This works out to roughly $5.63 per gallon for only the monthly fee – Given we usually pay $4.99 for a gallon of pasteurized organic milk, that’s not too bad. This is whole, raw, organic milk, obtained from cows right here, cared for by someone we’ve met. I like that. It’s good. It will be a fair amount of work on the weeks when it’s my turn to go – I’d imagine there will probably be 30-40 containers to pour, depending upon how many shares people in the group have. For this group, the members drop off their coolers and containers at the driver’s house sometime before Friday. The driver heads up to the farm, pours and seals the containers, then delivers the coolers back to the folks’ houses directly. Seems like a good system to me, and the milking barn hours are from 9am – 5pm, then from 7pm – 9pm to accommodate all manner of schedules. I’m really pleased with having found these folks, and happy to support them in their work. I hope some of you will be able to avail yourselves of their services, too. Isn’t it amazing when you really know where your food comes from? Raw milk is illegal where I live – you are lucky! Andi – it’s illegal here, too – unless one owns the cow. The cow share program is a clever (but legal) way around that little piece of law. You may be able to do something similar where you are! Wow! Very beautiful cows! I am really excited about this. Corrine not yet. She doesn’t think we will drink enough milk. She doesn’t drink it since she doesn’t trust the store stuff. I stick with soy milk for now. She loves the idea, we are just still in the planning process! OCD people like her have to process everything to death! But it will happen! Thank you for sharing this! I bet it tastes fabulous! Cow sharing isn’t legal here either – and the government means business on this point as one farmer who tried it had armed officers come to his farm to stop the operation and he was taken to court. So…until I get my own cow (which isn’t likely!) I’m out of luck. Enjoy your milk! I’d love to hear what differences you discover in having raw versus pasturized.